Press to release and lock the bolt of oscillating weights. Sturdy, stable, precise and easy to use. Releasing the bolt of the oscillating tool will be a piece of cake when using this tool. For calibers ETA 2891, 2892, 2893, 2894, 2895, 7750, and 2000/1. To release the bolt, simply set the notches "B" in the corresponding slots while pushing vertical on the tool Fig.1. Maintain the oscillating weight and turn the tool 1/4 of a round Fig.2. Then release the bolt Fig.3. This Horotec tool comes with two quick change keys and one handle. Open Oscillating weight bolts now for the ETA 7750 and ETA 2000-1 series as well as the ETA 2892-2893-2894-2895 movements. Many Omega movement models are based on these ETA calibers and they also used the same two size keys. The tool comes with 17 interchangeable keys for screw-on pushers or tubes, oscillating weight bolt and battery cover. It can be use on Rolex®, Breitling, Omega and Swatch movements. The kit features 17 keys, the master handle and a weighted storage base to keep all of the items organized and accessible. 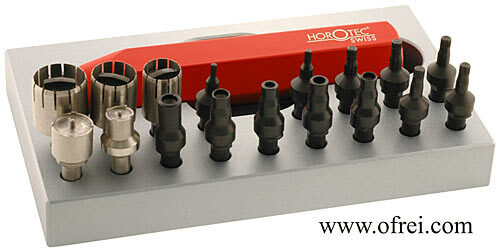 These tool bits are for Horotec Generic Rolex® Tubes: MSA-03.620-01 diameter 1.50 mm works on MSA-65.001 screw on tube , MSA-03.620-02 diameter 1.80 mm works for MSA-65.002 screw on tube, MSA-03.620-03 diameter 2.65 mm works for MSA-65.003 screw on tube, MSA-03.620-04 tube diameter 2.75 works for MSA-65.004 screw on tube, MSA-03.620-05 tube diameter 2.95 mm works for MSA-65.005 screw on tube, MSA-03.620-06 diameter 3.00 mm works for MSA-65.006 screw on tube, MSA-03.620-07 diameter 3.00 mm works for MSA-65.007 screw on tube. 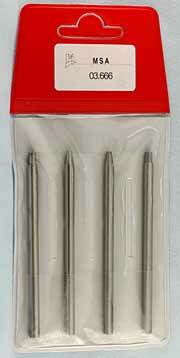 The Horotec Generic Rolex® tubes can be found on page 73 of the Horotec 2005 Watch Parts Service Catalog. These tool bits are for some Horotec Pushers: MSA-03.620-203 works on Pushers MSA-61.203 and MSA-61.703, MSA-03.620-207 works on Pushers MSA-61.207 and MSA 61.707. The MSA-03.620-P3, MSA-03.620-P27, and MSA-03.620-P39 are the same as the Bergeon 5901-P3, 5901-P27 and 5901-P39, which is mostly used on Omega pushers. These tool bits are used on the Oscillating Weight Bolts of the ETA 2892 and Val. 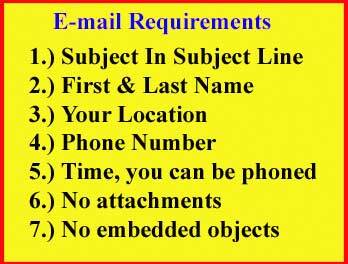 7750: MSA-03.620-2892 works on the ETA 2892 and MSA-03.620-7750 works on the Val. 7750. The MSA-03.620-GENT, MSA-03.620-LADY, and MSA-03.620-MED tool bits are used to open the cell hatches of Gents, Ladies and Medium Swatch watches. 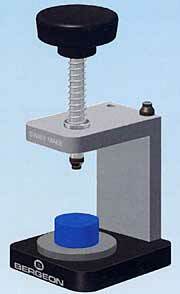 This is the latest oscillating weight bolt tool that Bergeon developed. Bergeon took the idea of Horotec's design and made it better by allowing the user to store the second key inside the tool for convenience. Made with Swiss anodized aluminum handle and two stainless steel heads. Head #1 is 10.3mm diameter and Head #2 is 7mm diameter. Open Oscillating weight bolts now for the ETA 7750-7770 and ETA 2000-1 series as well as the ETA 2892-2893-2894-2895-2896-2897 movements. Many Omega movement models are based on these ETA calibers and they also used the same two size keys.